Britain’s struggling retailers have faced well-documented battles to attract shoppers through their doors. Slower footfall on High Streets and a rise in online shopping has led to many shops feeling the pinch in what is traditionally their busiest period. 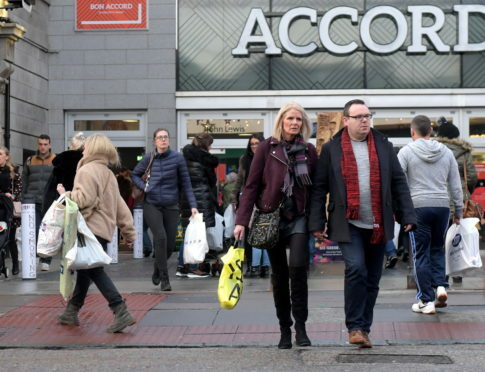 But in the busiest weekend before Christmas, shops in the north and north-east have confirmed their tills have been ringing merrily – with 120,000 customers at just one centre in Aberdeen. John Thompson, deputy manager of the Granite City’s Trinity Centre, said that recent weeks had been slower in sales, but shoppers had flocked through the doors in the final days before Christmas. He said: “In the general Christmas period, it has been steady, but the last week especially has been crazy. Craig Stevenson, the Bon Accord Centre manager said: “Our Christmas trade has proved strong with positive visitor numbers during the lead-up to the big day. Jackie Cuddy from the Eastgate Centre in Inverness was also upbeat about the packed stores in the Highland capital. She said: “People seem to be getting out and shopping much earlier. Our car park was full at 11am. “But retailers are reporting a very strong shopping day on Saturday, with a good start on Sunday”. A spokesman for St Giles, Elgin said: “We were a lot busier on Saturday than we had expected, so it was a good day for everyone. Fiona Fraser, of Fiona Fraser Jewellery Design in Oban, said: “Saturday was a good day.